front page: One of Hawaii’s best all-around waterman Kai Lenny (pictured) is up in Round 1 Heat 8 to finish up the round. BANZAI PIPELINE, Oahu, Hawaii (Saturday, February 2, 2019) – The World Surf League (WSL) men’s Qualifying Series (QS) Volcom Pipe Pro QS 3,000 is ON. A field of 144 will begin competing in 3-to-5-foot NW swell with beachbreak-like conditions to start proceedings at 8:00 a.m., beginning with Round 1 Heat 1. 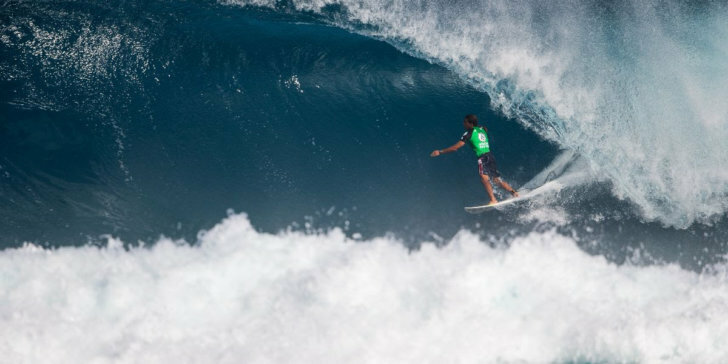 This is the highest-rated event in the first half of the WSL Hawaii/Tahiti Nui regional season with valuable points on the line to help competitors begin their run toward the Championship Tour (CT). Contest organizers expect to finish Round 1 and get straight through Round 2 Heat 11 by day’s end. The 25-minute, 4-man priority heats will be highlighted with some of the region’s top QS talents in Round 1. Just a few names set to debut in Round 1 from the Hawaii/Tahiti Nui circuit; Da Hui Backdoor Shootout winner Tyler Newton (Heat 1), one of the top young talents in the world Eli Hanneman (Heat 2), former Big Wave World Champion Makuakai Rothman(Heat 5), Pipe specialist Eli Olson (Heat 7) and all-around threat Kai Lenny(Heat 8) are just a few standouts to watch for in the early goings. For more information about the Volcom Pipe Pro, visit worldsurfleague.comand volcom.com.